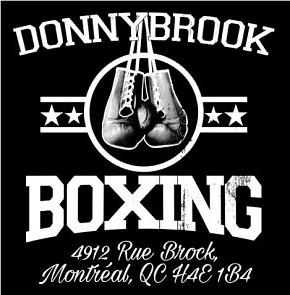 When a prizefighter decides he has had enough for the night and signals surrender, a variety of attitudes and opinions from the boxing fraternity are revealed. The “Q”-word is something of a taboo subject in boxing, one that the vocal and highly opinionated among us will shout about to be clear which side of the argument they are on. Others, perhaps more reserved, will defer from making declarations one way or the other and pause for a moment before reaching a conclusion. 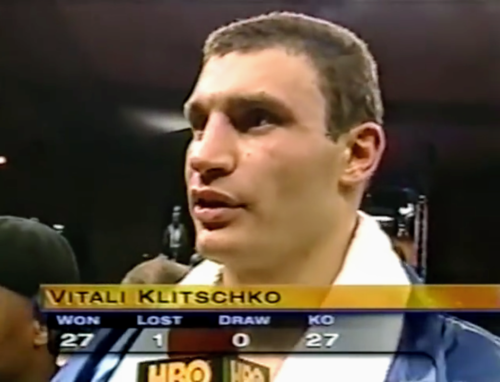 A young Vitali appeared unstoppable. In a boxing ring we too often remember the man or woman who could not carry on (or did not want to), more than the victor and what they achieved. We are sometimes too aghast at the sight of a gladiatorial figure choosing to stay on their stool, who cannot, for whatever reason, answer the bell. And thus in a world where a phrase becomes a hashtag that then becomes a trend, the term ‘NoMasChenko’ has taken on a life of its own in boxing. 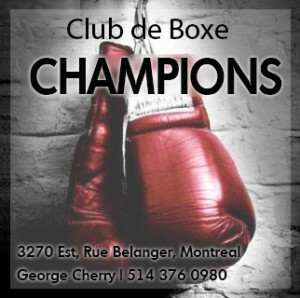 It is an expression coined by a pugilistic Einstein (Vasyl Lomachenko) who plays with his opponents inside a boxing matrix so overwhelming that four consecutuve opponents have surrendered. But when we recall the likes of Nicholas Walters and Guillermo Rigondeaux waving the white flag, do we remember exactly how the grandmaster forced them to submit? Vitali quickly dispatched Hide to become champion. On this day another Ukrainian played the reverse role, the one of the quitter. He was a fearsome six foot eight, 244 pounder who had all the physical advantages and more over Chris Byrd, but he chose not to continue in a battle he was winning on the official scorecards. 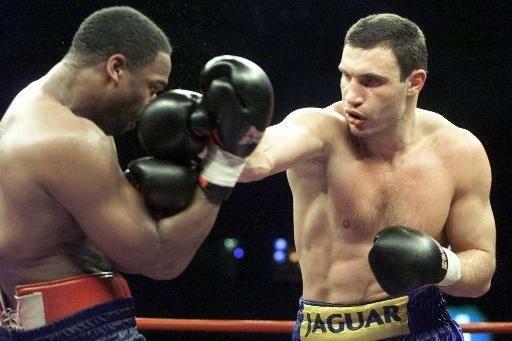 In 2012, a dozen years after he lost his WBO heavyweight title to Byrd in Berlin due to a shoulder injury, Vitali Klitschko admitted he gave up in the third defense of a title he took from Herbie Hide in under five minutes in 1999 on a night when the capricious Brit looked like he wasn’t sure if a right hand or an anvil had hit him after the second knockdown. Ten months later and the smaller Byrd, who had never seen the champion fight, flew to Germany on eight days notice following the withdrawal of original foe Donovan “Razor” Ruddock due to illness. Chris “Rapid Fire” Byrd was a middleweight in a heavyweight’s body. The Flint, Michigan southpaw won a silver medal at the 1992 Olympic Games in the middleweight division and would make his pro debut a year later weighing just 169 pounds. It was not long before Byrd realised that to get big fights and bigger financial rewards, particularly after not being paid for his first two pro bouts, he would have to bulk up and take his elusive style and an extra 50 or pounds up to the heavyweight division. Larger heavyweights underestimated Byrd at their peril. 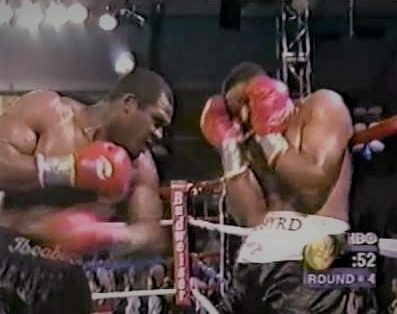 Six years into his heavyweight hopes Byrd faced the fearsome Ike Ibeabuchi and during the fight his less-than-dynamic performance came under fire from HBO’s Larry Merchant. “This is a lot of junk is what he’s giving us here,” said the veteran broadcaster, lambasting Byrd’s negativity and lack of aggression before a wild left hook and a right hand put Byrd down and ended the match in round five. 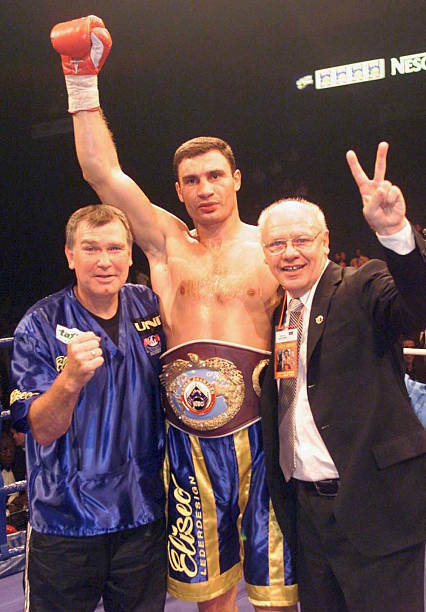 Thus, when Byrd fought Klitschko, with his parents Joe and Rose doing corner duties as usual, here was a man who was seen as nothing more than a slightly awkward obstacle which needed to be removed before the Ukrainian faced Lennox Lewis. And during his brief stay in Deutschland, Byrd would have difficulty with the local cuisine which in turn saw him lose several pounds in weight before fight night. Not what this particular David needed going in against his Goliath. Byrd on the ropes and taking shots from Ibeabuchi. From the first bell Klitschko’s mechanical style backed Byrd up, forcing the challenger to retreat and employ enough head movement for a featherweight to be happy with in hopes that Dr. Ironfist would need a cure for why he wasn’t able to land on the diminutive heavyweight. Klitschko displayed enough work rate and landed enough punches to make everything seem routine, the way it was meant to go. He was not dominant, he was not overwhelming the American, but he was doing the right amount of work to see him push ahead on the scorecards. Little did we know that Klitschko had encountered a problem in the third round, an old injury to his left shoulder that was not evident to the spectators. Still, the single cannon right hand – albeit a weapon on this night which seemed to lose its potency early on – was providing enough trouble to deter Byrd from really threatening to cause an upset. 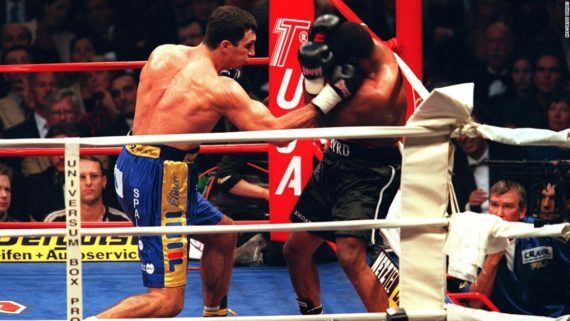 That being said there were moments from Byrd, particularly when throwing to the body, doubling up on the left hand, and forcing Klitschko to the back foot, which showed signs of a competitive fight. Byrd, like a lumberjack chopping at a tree with a pick-axe, was slowly chipping away. There was of course no damage, but the tree would wobble on occasions due to the lumberjack’s persistence. 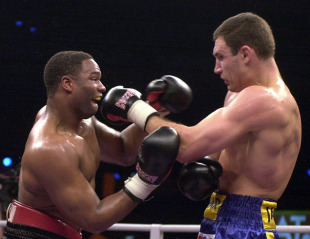 Byrd and Vitali mix it up. Never being the most graceful fighter to observe, Klitschko’s clumsy fighting on the back foot gave hope to Byrd whose father between rounds reminded him to stay off the ropes. Byrd’s hand speed, body positioning and angles were working. 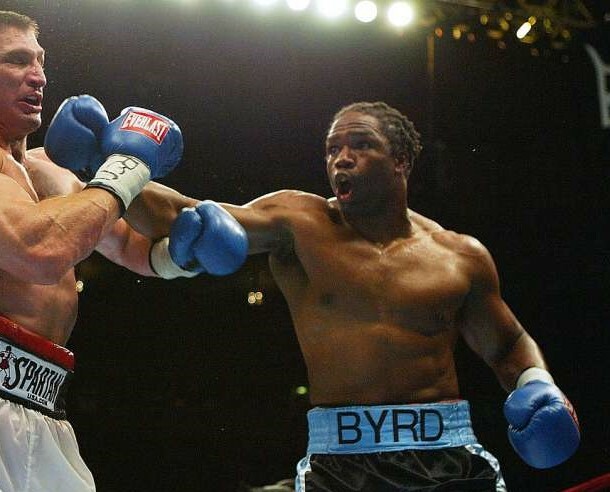 And having caught as many tappy left hands as Klitschko could offer, combined with a right hand that was never fully loaded that night, Byrd looked like he was beginning to believe in his plan, that being to get past the early rounds and then take control. And, in what would be the final round of the contest, Byrd was winning over the crowd. The final 30 seconds proved as much when the American turned up the pressure, throwing his best punches of the fight and showing an offence that Klitschko could contain but never looked entirely comfortable with. The bell rang to end round nine and then the most unexpected conclusion played out. “Is it hurting?” asked Klitschko’s trainer Fritz Sdunek as his giant sat down. “It hurts too much,” replied the champion. The fight was over. America had another world heavyweight champion in the unlikely size and shape of Chris Byrd. Vitali apologizes but the crowd was not pleased. What we had witnessed was a world heavyweight champion giving up on a fight with only three more rounds to go and the high probability of a decision being rendered in his favour. The confirmed scorecards from the judges, two of whom were American, saw him comfortably ahead by scores of 88-83 (twice) and 89-82. Meanwhile, Byrd was quick to point out an interesting parallel, noting that, “I fought Ike (Ibeabuchi) with separated ribs and no-one knew about it.” No doubt Byrd would have appreciated similar discretion on the part of Dr. Ironfist. Younger brother Wladimir avenged Vitali’s defeat. 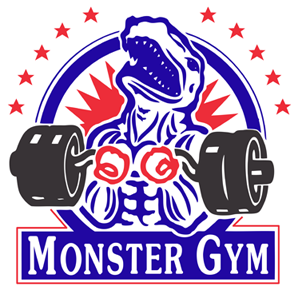 Vitali Klitschko would never avenge his loss to Chris Byrd, leaving that task to his more athletic and heavier handed brother Wladimir to do six months later in Cologne. 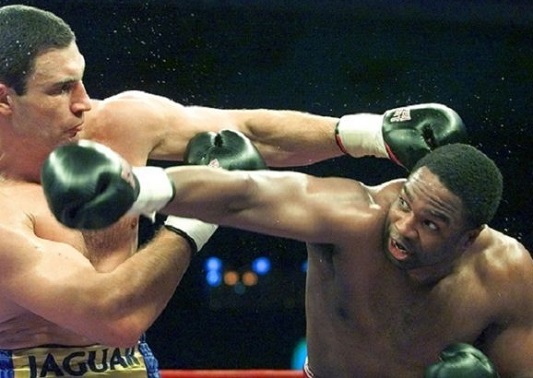 “Wladimir hits three times harder than Vitali,” Byrd would say years later. Having acknowledged his poor decision of quitting against Byrd there is little doubt that Vitali Klitschko regretted what he did. 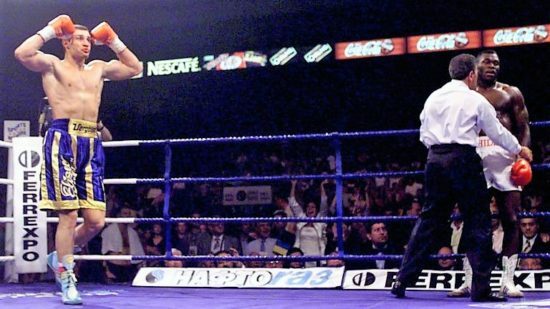 But his reputation, something he had to pick up from the floor and rebuild after the loss, was largely restored later in his career, particularly in his gutsy stand against Lennox Lewis in 2003. 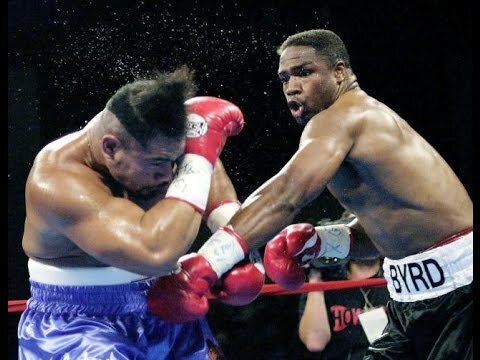 Byrd remained relevant with wins over top contenders like David Tua.